I generally have little sympathy for people who are 'caught out' at 'point' restrictions because on the whole they are laid out logically and to miss the restrictions takes quite a lot of effort. However, sometimes they are not always clear and despite the signs, people still drive through. A 'point' restriction is in essence a line across the road over which only some people are allowed to travel (or if we are being pedantic, it could be a very short section of road). Bus gates are a common type of point restriction and the are used to give passengers a journey time advantage over general traffic where drivers have to take a long way round. Before turning on enforcement cameras in 2017, we increased signage at all junctions, sent more than 3,000 warning notices and painted the words "BUS GATE" in five-foot high letters on the road at both entrances to help make drivers aware of the restrictions. So what is going on because there are actually plenty of signs in the area and there are indeed five-foot letters saying "BUS GATE" painted on the road. Perhaps more to the point, why am I having an off day by having any sympathy at all? 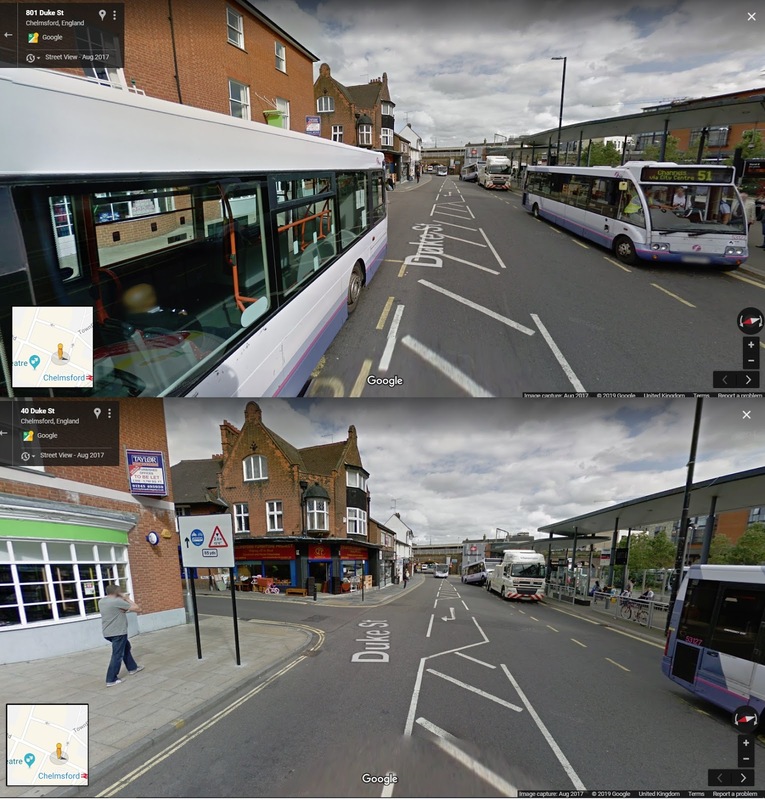 Chelmsford is a typical UK city which has become a victim of car-centric spatial and transport planning. There are lots of big roads around the place and lots of congestion and the pace of development in the area doesn't seem to be letting up as some of the old industrial areas become out-of-town-but-in-town retail parks. The bus gate itself actually allows passage by buses, cycles, taxis and motorcycles and the headroom of the bridge restricts larger vehicles (maximum height of 3.8m). The bridge is also narrow and so it operates as a "priority pinch point" which has relevant traffic signs and so therefore, it is fair to say that there is quite a bit going on. 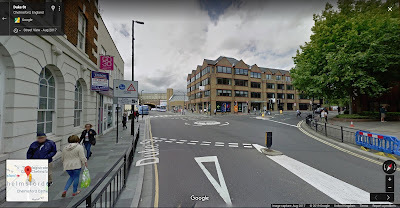 Victoria Road South is the A1099 and takes traffic from the A1060, a large dual carriageway which skirts the south of the city centre, and feeds it north in the city centre. Victoria Road South is dualled for a short section, then it gradually narrows. 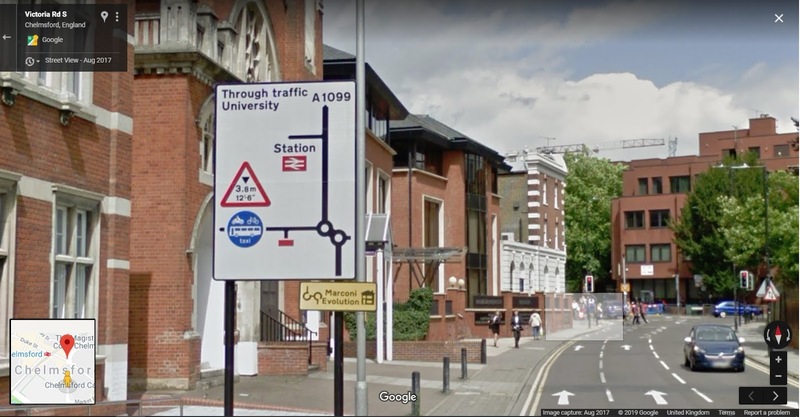 The station is signed from the A1060 and so people who don't know the area are going to be relying on the signage. 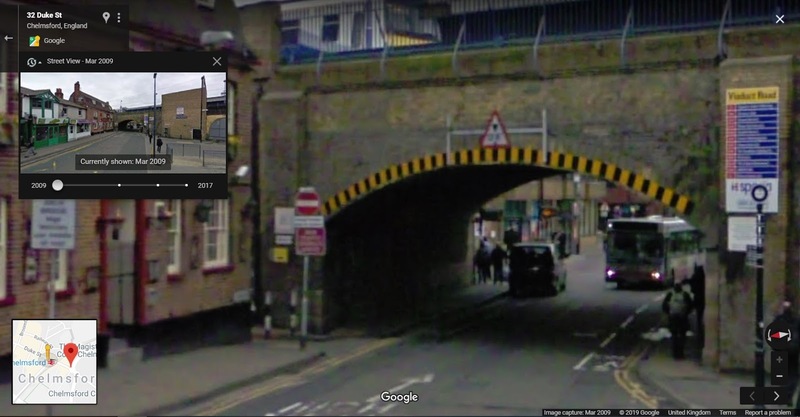 For some reason, the mini-roundabout traffic sign hasn't been put in here (it should have been, it is a requirement). 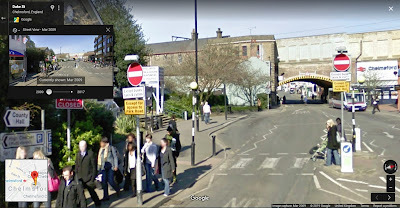 If you do manage to see the direction sign, you are again warned about the bus gate and height limit ahead, although the arrow on the sign might perhaps be taken as an instruction to proceed ahead at a glance? So we end up with people driving through. If the person knows the area, then perhaps they should know better. If they don't well, perhaps we can see how they go to this point. 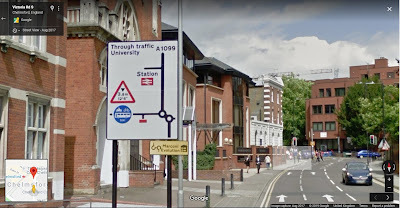 I'd be willing to bet that the old layout might have stopped more people coming through because the no entry sign is more recognisable than the bus gate sign in by view. 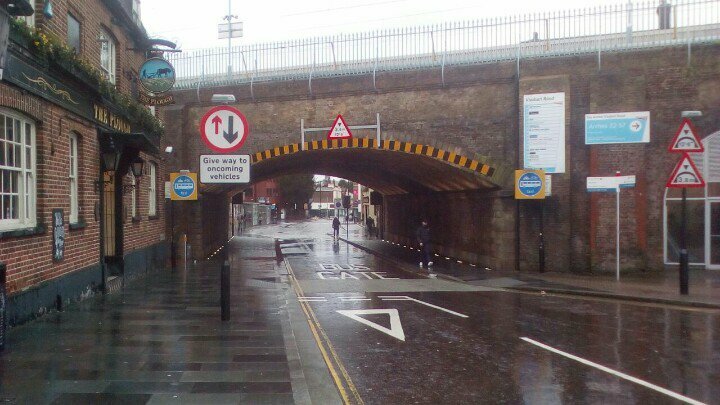 The context with the no entry approach (despite not being permitted at the time) is you cannot come through here, except these vehicles. The bus gate sign is these vehicles can come through but you cannot. The better way to influence behaviour is by designing street layouts which are legible and readily understandable by users as what is being expected of them. 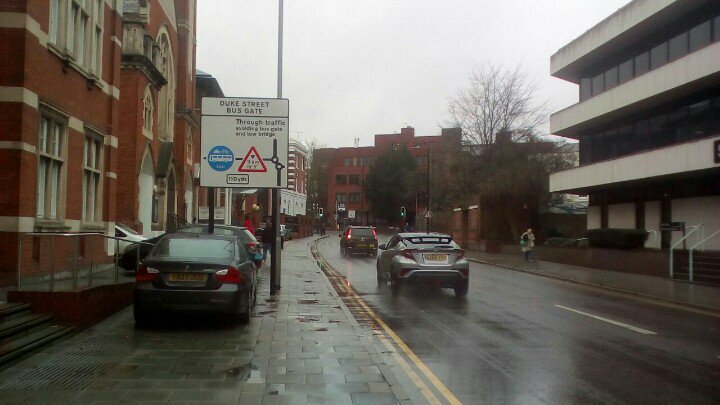 The traffic signs are then used more sparingly and are just there really to give effect to the restriction. 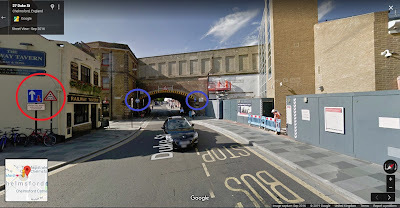 In the case of Duke Street, the best option would be to close the road under the railway completely so the restriction isn't needed, but it is a bus route and so that's not feasible. We need to step back from the bus gate position and look at redesigning the road layout. 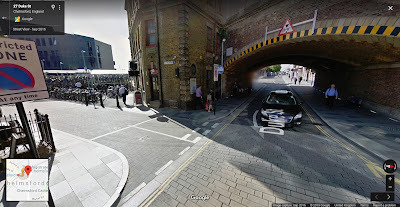 For example, at the double mini-roundabouts we could get rid of them and simplify the junction to make the part of Duke Street serving the bus gate subservient to the A1099 (a side street) so that the "natural" route will be for through traffic to pass through and those accessing Duke Street making a conscious decision to turn off the A1099. From the other side, there could be some separation to create a similar arrangement or even move the bus stop to the other side of the side road and change the sign to have an arrow pointing to the left saying "through traffic". There are probably other layouts which would help. I guess my message this week is that it is right to point and laugh at people getting fined for their own stupidity most of the time, but it is also worth pondering if the design approach in the situation has magnified or aided the stupidity. With big thanks to the 2 Wheeled Wolf, we have an update on the sign situation fresh from the site contained in a Twitter thread, here. 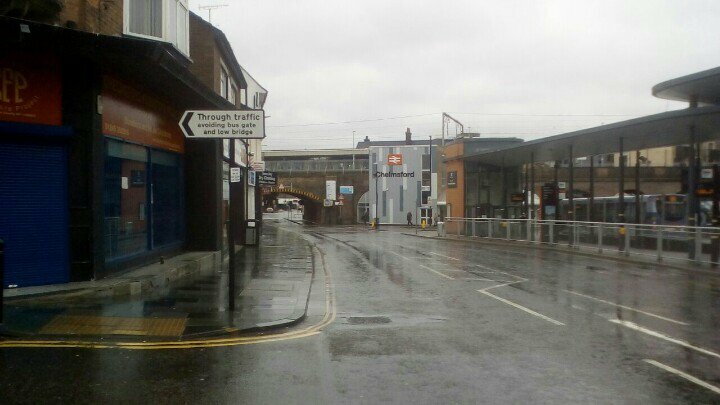 This is Victoria Road South which replaces the first image in the post. There is now a panel at the top mentioning the bus gate with a tweak to the through traffic message. This is the view of the bridge from the Park Road side. 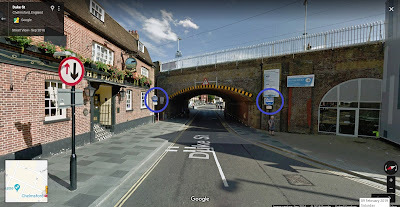 We can now see the bus gate signs now have yellow backing boards to make the more conspicuous and we also see the "BUS GATE" carriageway marking. 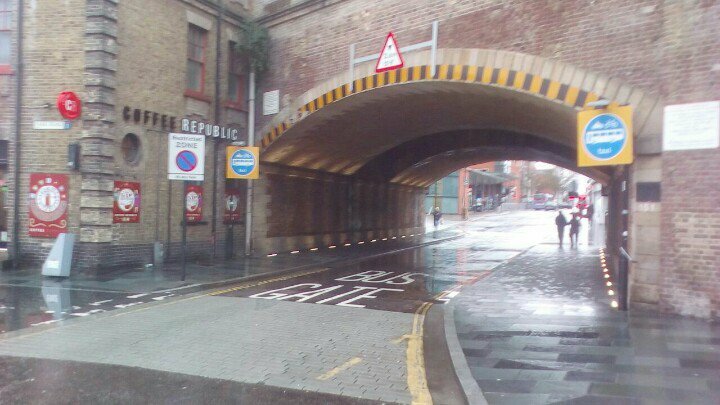 This is from the bus turnaround side of the bridge - again, the yellow backing boards have been deployed along with the carriageway marking. Finally, a view a bit further back with the through traffic sign that I suggested might help (as long as the view isn't blocked by a bus). Have a look at Wolf's thread for the full set. So, where does that leave us? Perhaps I was being too charitable - but even with all of these signs, people are going through. Some will be taking a chance, but what about the rest - poor drivers or does the design play a part? So much for what I know! TSRGD has thoughtfully provided a more appropriate signage option Prohibited Traffic. Surely more realistic, as well, since this could never be seriously offered as a through traffic option, via the bypass roytes. I suppose one point that should be made is that 'bus gate' is a technical term that many people probably don't know. 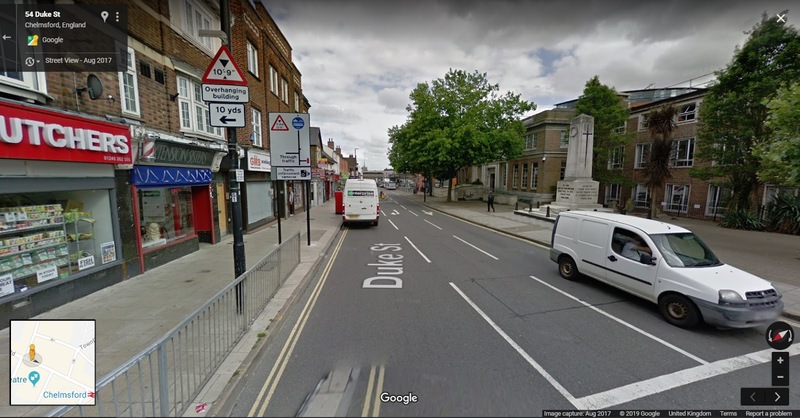 We're so steeped in it that it is hard to imagine the mindset of people who don't ever think about buses, but no doubt there are many in places such as Chelmsford. 'No Entry' signs and writing on the ground are something that everyone understands, I think, but 'Bus Gate' requires the person to (a) know what a bus gate is and (b) that it means do not enter if you are in a private car. As someone who's lived & worked in Chelmsford, I know this has been a Bus Gate since 2011 & those who regularly visit or live in Chelmsford know this exists & people think its perfectly to drive through it, hence why cameras were installed almost 2yrs ago with extra signs. 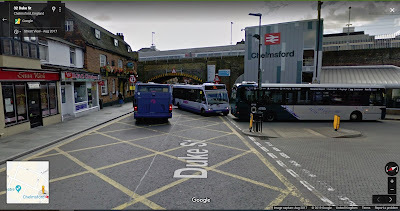 https://www.essex.gov.uk/News/Pages/Duke-Street-bus-gate-enforcement-to-commence.aspx, IMO there is no excuse to go through. It's just pig headed drivers refusing to take a slightly longer route & deserve the fines. Essex Live though is pro-car & happily stir up the usual nonsense like one mentioned & has done since the Bus Gate existed there.